Thanksgiving is my holiday. It is where all the stars align with my favorite things. Food, family and football. I even enjoy all the prep work that it takes to pull off hosting this large dinner. 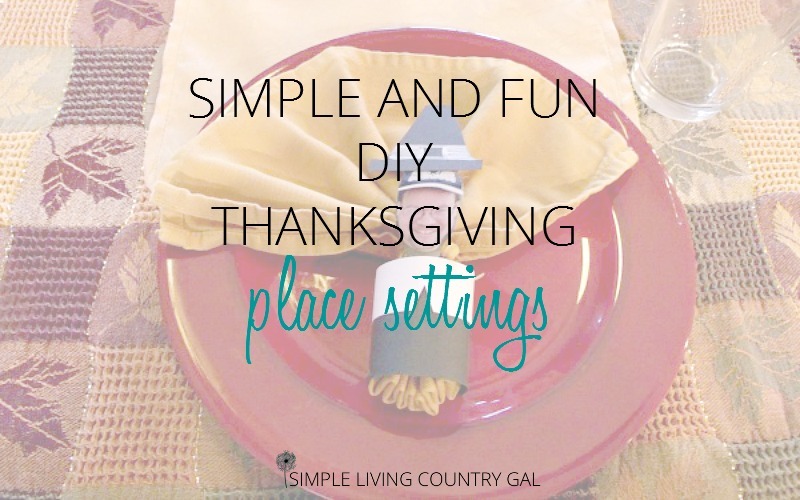 From the food to the decorations and yes even the thanksgiving place settings, I map it all out step by step so nothing is overlooked. The way I feel about it, my family and friends are trusting me to hold this holiday and I truly want to make sure they have the best time possible. Now, hosting such a holiday does not have to break the bank. I am all about cheap trust me. 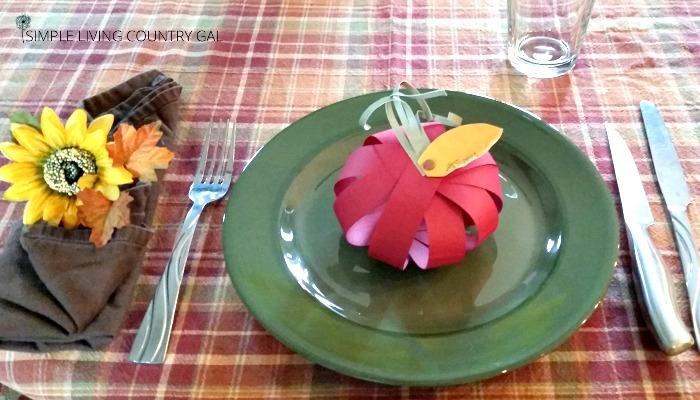 So today I am going to show you my super simple, super cheap DIY Thanksgiving place settings. Just another touch to make the holidays a bit more fun and laid back. Hosting a dinner is a chance to really get my creative juices flowing. From the menu to the centerpieces, I love to pull out all the stops. One of my favorite parts of the table is the place settings. Every year I try to come up with something new. Something fun. I want my guests to enjoy the holiday and keeping things light and yes, maybe a little silly really sets the tone for a fun and relaxing day. 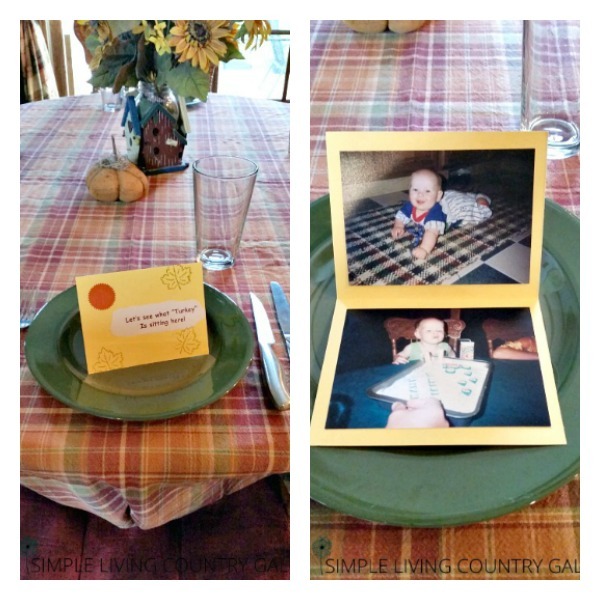 These are some of my favorite place settings I have used over the last several years. All of them are super simple to make and cost little to no money. And you know by now, I am ALL about saving money. Several years ago I wanted to really change things up a bit. I decided to have my guests work a little to figure out where they were sitting. 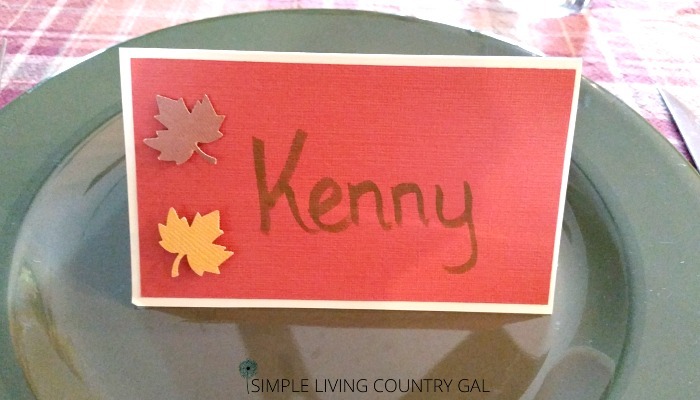 I took some fall colored card stock and decorated the outside with leaf stamps and stickers. I folded the card so it would stand up on the plate grabbing my guest’s attention. Inside I glued 2-3 childhood pictures. If I had more I would put one or two on the back as well. Since quite a few of my guests were family, I had most of these photos on hand. The others simply took a quick phone call. Most people were more than willing to dig up a few embarrassing pictures for me. As people began looking at the place settings things got a little rowdy. My family began running from plate to plate laughing at the awful pictures I had dug up. All I can say is the 70’s was not an attractive era for anyone. At the request of my horrified family members I was not given permission to use their place settings on here. Cowards. 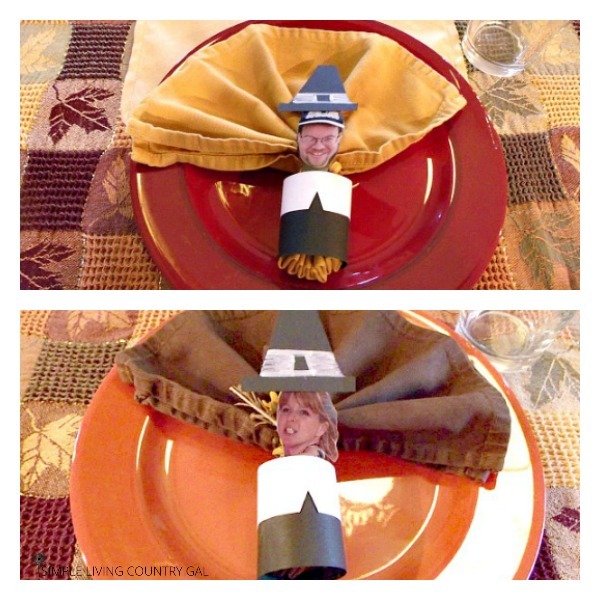 Keeping with the same “embarrass my guests at all costs” theme last year I did pilgrim people. I found this idea on Pinterest and it was super simple to make. I was able to create all 13 pilgrims in an hour, so that is a perfect time frame for these adorable settings. You only need black and white card stock and again some old and awful pictures of your guests. This time you only need one but you will have to cut the picture so make sure you okay with that before you commit to this project. There are some years that silly just doesn’t make it’s way to our table. These simple yet lovely paper pumpkins are a great way to get your guests to the right seat and show off some of your crafting skills in the process. You simply cut strips of matching construction paper 3/4 of an inch wide by 11 inches long. Attach at the bottom with a brad. Before attaching the top add some curled green paper and a leaf with the guest’s name printed on it. Attach again with another brad and adjust the pumpkin papers to create a pumping shape. Super simple and adorable too! My last idea and my simplest one yet is just card stock with a name printed on it. To be perfectly honest I was completely without an idea that year and this is what I came up with. As a last minute idea, guests were encouraged to write a few things to be thankful for. They were then asked to take the cards home and keep them as a reminder of all the good they have in their lives. Remember you don’t have to go all Martha Stewart to have an impressive Thanksgiving. Keep it simple, keep it fun and enjoy the day with family and friends. Now it’s time to start thinking about what to do this year! « How To Create A Weekly Menu And Ensure You Remember To Use It! Very cute idea. Everyone will get a chuckle out of those place cards. 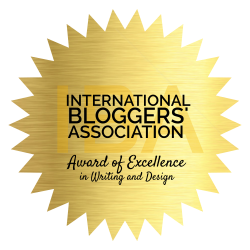 Thanks for sharing at DI&DI.